I'm not sure why, but I really like to work small. 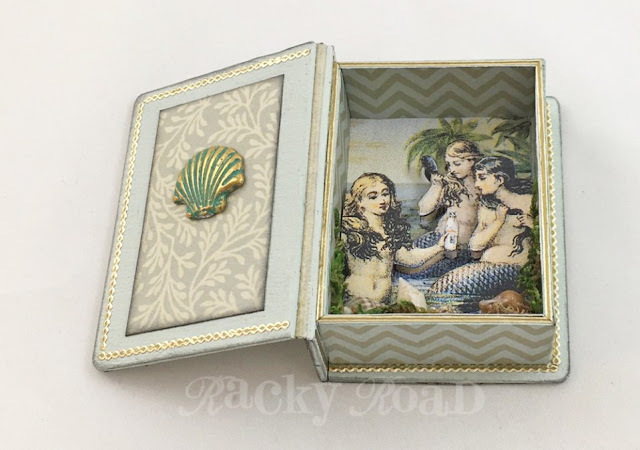 So when I had my choice of projects this month from Alpha Stamps, I chose to work on a Matchbox Sized Faux Book Box (only 2 1/4" tall!) 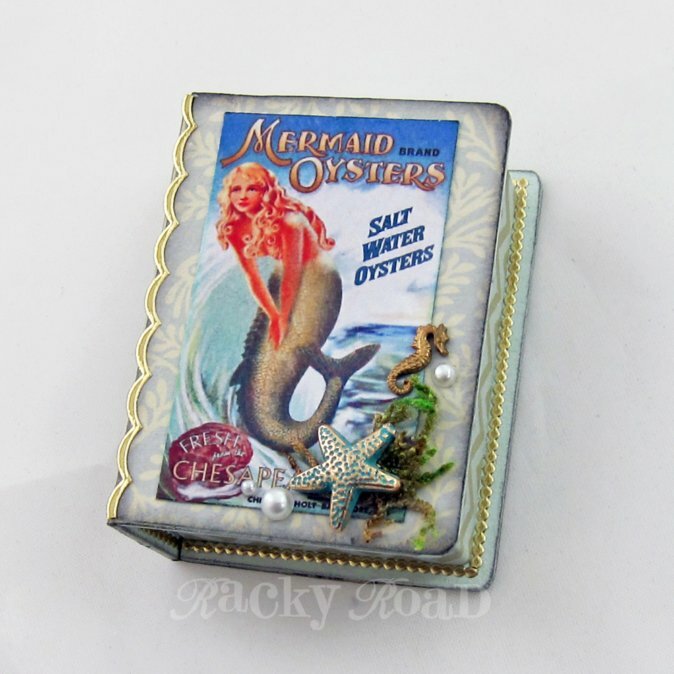 It's the perfect size for a tiny shrine. The papers in this month's kit made me think "beach", and "beach" made me think mermaids. The outside of the box was wrapped in a lovely shell and seaweed paper, and then covered with a tiny beach poster advertising Mermaid Oysters. 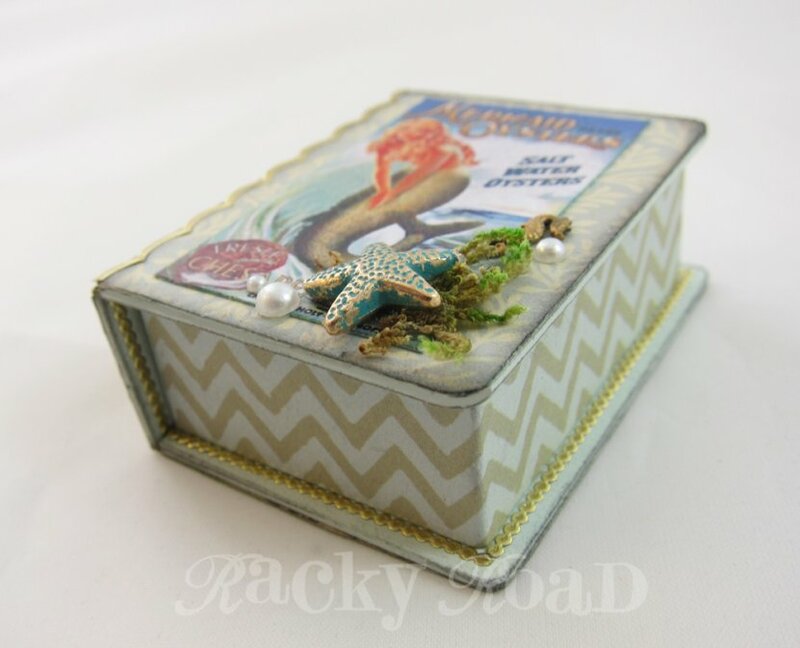 I used a couple of charms, a tiny pinch of sheet moss, and some flat back pearls to give the lid a bit of dimension. The sides of the box have a fun coordinating pattern, and some Dazzles thin line gold border stickers around the edges. I'm sad to report that those stickers have been discontinued, but if you want a little splash of gold, this thin line stripe tape should do the trick. 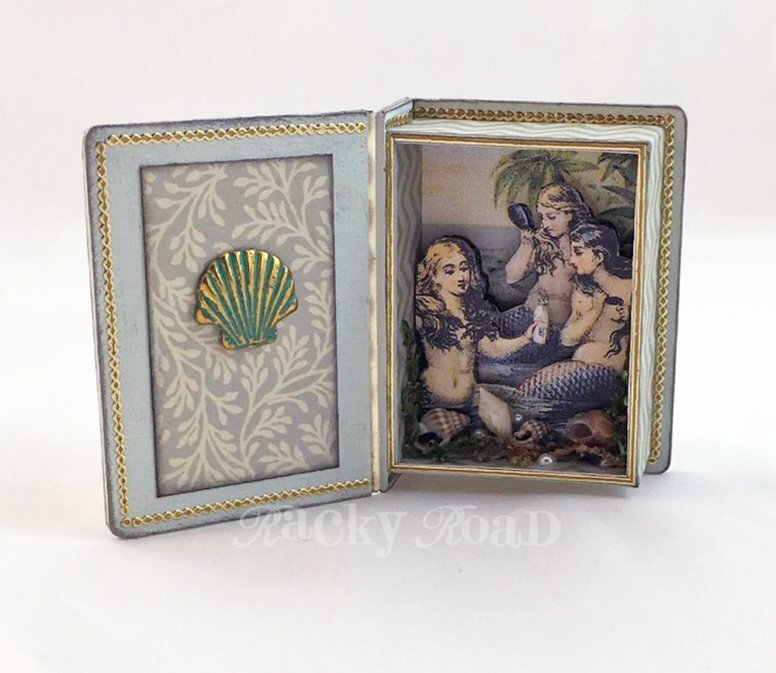 For the inside of the box, I found a great image of mermaids that coordinates nicely with the new papers. I used three copies of that image to create dimension. 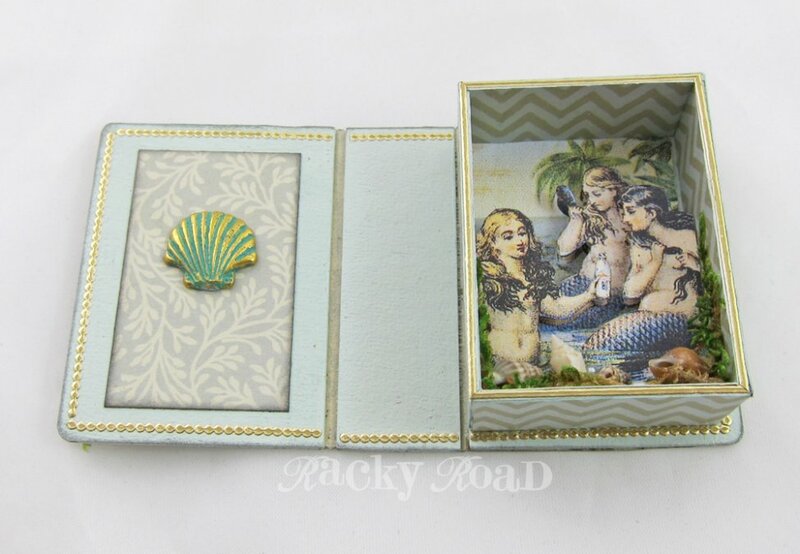 Moss, tiny seashells, and a few more pearls were added to the bottom of the box. A brief tutorial is below. 2. You can build up your mermaids using as many images as you wish. Two will work fine, but the box was deep enough to use three, so I decided to go for it. 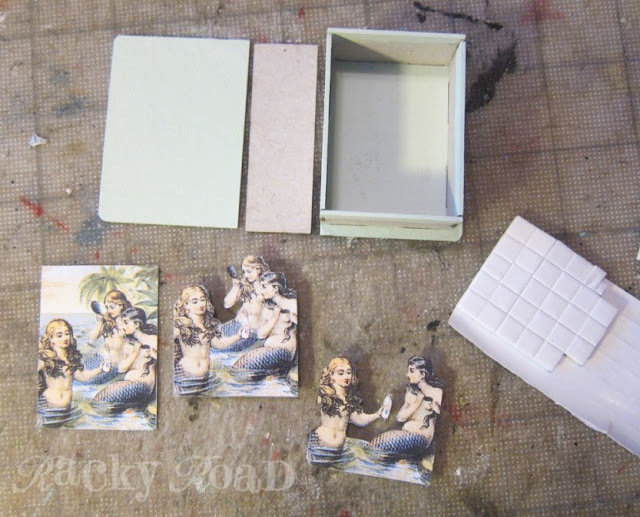 Cut one image out to fit the back of the box, one image of just the mermaids, and one of the two mermaids in the foreground. 3. Put foam tape on the backs of the mermaid images. 4. One at a time, adhere the images to the background. Make sure you do this before you put the background into the box, because you want to make sure your images are lined up perfectly. 5. 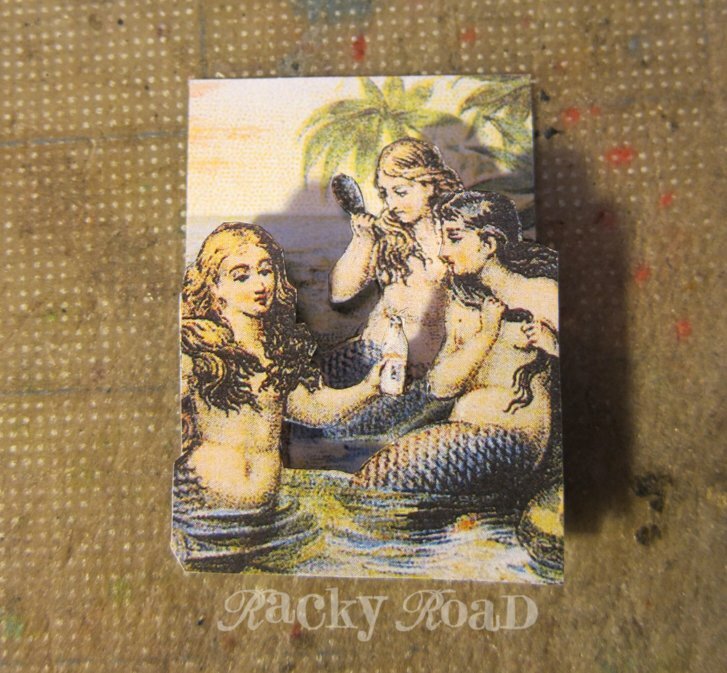 (See, I did go back and paint that one piece!) I didn't have any cloth bookbinding tape on hand, so I used masking tape to attach the sides and top of the cover to the box. Tape first, making sure the box closes correctly, and then add the scrapbook paper to the top, sides and bottom of the box to hide the majority of the tape. I wanted a little of the patterned paper on the inside cover, so in order to assure that the box would close correctly, I made sure that the paper was in an area that would fit inside the box part when the lid is closed. 7. A little note on the starfish charm on the front, and the seashell charm on the inside: because they are charms, they each came with a loop. 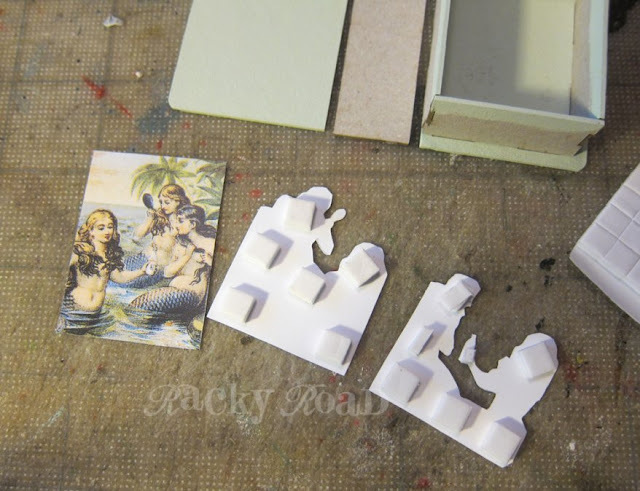 I clipped the loops off with small wire cutters and then used a metal file to smooth down the rough edge a bit. 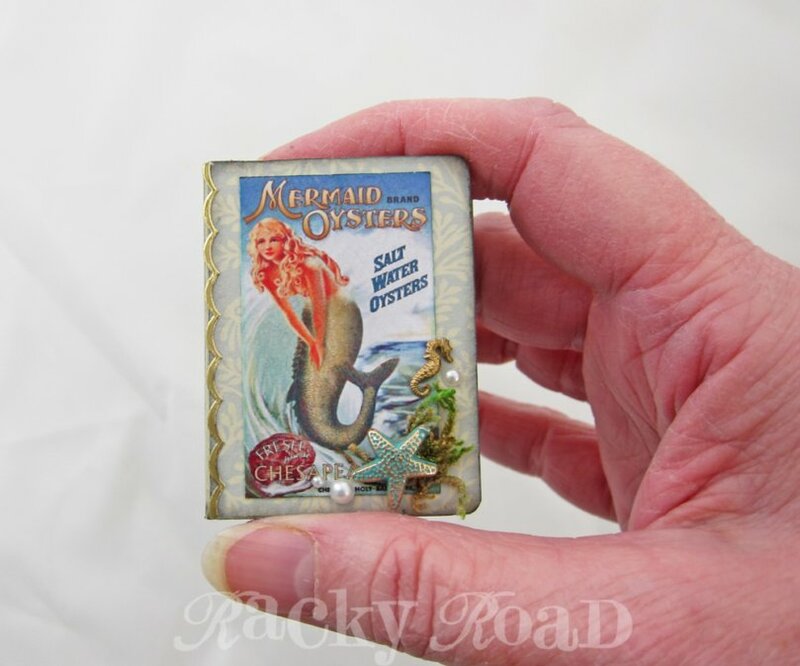 Here's the final project: a little bit of mermaid magic that fits in your hand. 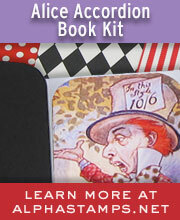 For a full list of supplies, click here!